What is TA-65 for Skin? What are the benefits of TA-65? What is the recommended dose of TA-65? TA-65 is a molecule which is extracted from the plant Astragalus. It is the only substance so far to be scientifically proven to extend the telomeres. There is also a range of products of TA-65 specific for the skin. The TA-65 for Skin complex of telomerase works deep into the skin by sending TA-65 molecules to act exactly in the places where they are needed. Unleashing the active substance in TA-65 for Skin generates its rejuvenation effect in all layers of the skin. This allows the cell rejuvenation to work locally and make age spots, senile warts and puffiness under the eyes all fade away. What are the characteristics and advantages of TA-65 for Skin? TA-65 for Skin improves the barrier function of the skin via, on the one hand, a skin-lipid-concentrate, and on the other hand – via an increase in ceramides of more than 38% of the bioavailability. This returns the non-greasy skin feeling with optimal delivery of active agents of TA-65 for Skin to skin cells. It stimulates the formation of liposomes. One of the main causes for aging of the skin is oxidative stress. It is caused by free oxygen radicals. The skin tissue is extremely sensitive to them. The onset of oxidative stress causes damage to the cellular proteins, the DNA and chromosomes. 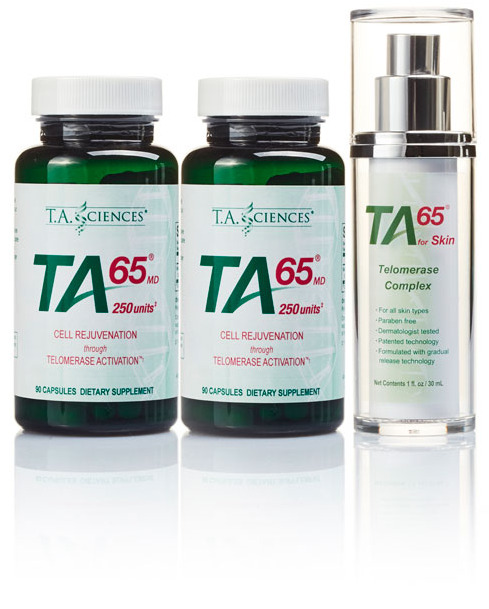 TA-65 for Skin provides defense against these radicals and therefore prevents damage of the skin. Anti-Aging.live is a website of Apran.com. Apran.com is proud to only offer products which it trusts 100% and can recommend. Visit our full website with more products and advice.